vignette design: What's For Dinner? That question is what I am thinking when I look at the new stove! It arrived yesterday and what an effort it was getting it into the house. But these two guys did it! After they delivered it to the kitchen, it was up to Ryan to hook up the gas and level it. Since the house is 106 years old, naturally the floor slants about an inch. Then the two of us pushed it back in to place. It's so shiny and new that I don't want to cook on it yet! Someone is going to have to christen it though! It just won't be me. I need some cooking lessons first! Isn't she a beaut? I'm going to call her Bertha! Big Bertha, perfect!! I am sure she loves her new, cozy home. D, it looks so perfect, just like it has always been there!! Love it so much for you and your family of chefs. Big Bertha is gorgeous!...if I were you I think I would just relax and bask in the radiance of her pristine glory for a few days...there is plenty of time for her to prove that she is more than just a pretty face! I don't care what you call her...just call me for dinner whoever cooks it. Lol. She is a beaut. I do know that what you have in the middle will get too hot when you cook as the gas flames really pack a heat punch and gas ovens usually vent up the back and get really hot too. Wouldn't want your beautiful cheese dish and oils to be ruined or catch fire. I am sure they are just there for decoration right now right? Oh. My. Goodness! She IS big AND beautiful! *** OMGIH, I have been WAITING to see this, and Delores, IT DOESN'T DISAPPOINT!!! BIG! It's so LUSCIOUSLY B*I*G!!! I'd be over-the-moon (even tho I'm NOT much of a "fancy-schmancy" cook anymore)!!! We (Jim seems to be "cooking" more than me!) have it's "baby" version, & must admit it DOES make a difference, at least to me~~~ and I oh-so-love the red knobs!!! I wonder why they're just a "turn-on" to me! (Pun there?)... (HEY! Maybe it ISSSSS all about "SIZE"~~~ grins!!!). ANYhooooo, am SO HAPPY that YOU'RE HAPPY!!! If I were you, I'd have a lovely, romantic picnic in the kitchen... Dom and all, & just to ADMIRE it while you cook hard boiled eggs. WHY hard-boiled-eggs you ask??? Cuz you can write hubby's name on one & give it to him, hugging him and telling him he's "A GOOD EGG" for getting this for you!!! I love Bertha...what a dream stove. I envy those red knobs. I have a stainless steel stove but it is not a Wolf and the knobs are on top on the cooktop (which was a very poor design), but since I only boil water it will suffice, l.o.l. Bertha is beautiful!! Can't wait to see your green glazed cabinets..your kitchen is gorgeous! Maybe your daughter and you should christen Bertha together!! Beautiful......and such a nice big one. Bertha is a beauty and I love the pretty runner too! Wow, wow, wow! Now shw us an entire kitchen post from every angle. love! Oh my gosh you lucky duck girl..
You must be feeling so inspired! 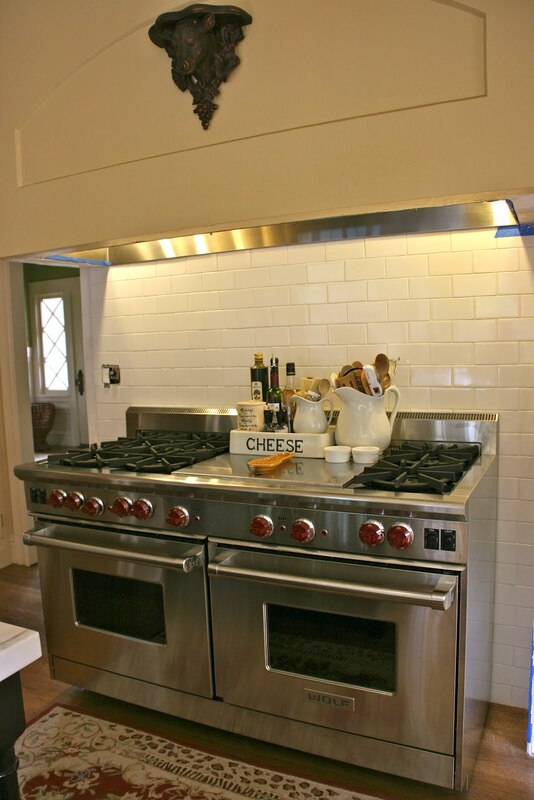 I have stove envy! Big Bertha is a beauty! Bertha was my husband's mother's name and I had heard she was a very good cook. I can't believe you haven't cooked on that yet. I don't like to cook, but would if I had a decent stove like that. As far as I'm concerned, there is nothing better than a Wolf for serious cooks. I hope you enjoy your new treasure. LOVE! When I get my Wolf (next lifetime - I mean kitchen) I'll name him Jake...after Jacob Black, the character who plays a WOLF in the Twilight series. Bertha's going to serve you well - ENJOY! ok, I just called my husband into the study to look at the picture of Bertha over my shoulder and announced to him that THIS is what I want for Valentine's Day!!! He groaned and said: "I have got to keep you off these blogs or I will be working until I am 90!". We have lately been talking about a complete re-design of our galley kitchen and this range just has to be my starting point for all things new!!! Thank you for inspiring me! OMG!!! I want you to know, Delores, that I have NEVER written OMG before, but big Bertha deserves it. She is so beautiful and SO HUGE. I wish you many, many years of happiness making wonderful meals or just enjoying how she looks. I must say I am equally impressed that you could help push this baby back against the wall. Have a great time in Oregon. Hei Delores!Was für ein schöne Herd...wow!passt bei mir am besten.hihi.Schööön!Schöne Woche wünsche ich dir.Bussi.Lu. I know you have waited a long time for this stove, so I can only imagine how thrilled you must be to finally see it sitting in your own kitchen. Bertha is quite a beauty. Regarding the cabinet paint colors: have you thought about painting the cabinets white and teh island green?